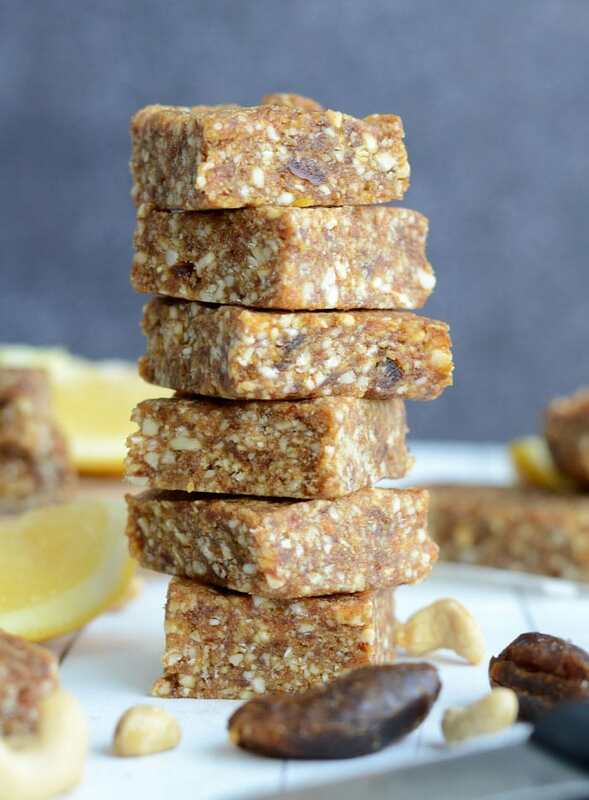 Isn’t it amazing how the simplest of ingredients, like lemon and dates, can transform into the most delicious of healthy treats?! These homemade lemon pie larabars are so simple I don’t know if I can even call it a recipe! All you need is dates, almonds, cashews, lemon and sea salt!! Blend, press, set, slice…EAT!! Be careful though, they’re rather addicting! I like to keep a stash of healthy snacks and treats on hand at all times so I always have to something to grab in a pinch. 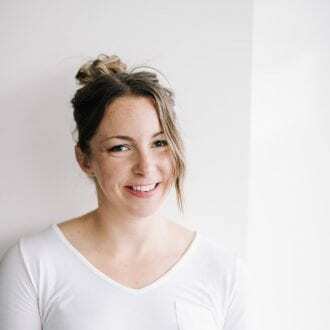 Raw energy bars are my go-to sweet treat because I know exactly what’s in them and I can feel good about snack time. Plus they’re so easy to make at home you really don’t even need a recipe for them. Basically throw a bunch of ingredients in a food processor until it forms a dough, then press into bars or roll into bars and your’e done! These are some of my favourite ingredients for making raw energy balls and bars at home. If you keep a selection of these ingredients on hand, you’ll always be ready to whip up some raw energy bites and bars! For a full list of how to stock a vegan pantry, check out this post. 1. Dates, raisins, figs, prunes or other dried fruits. These act as your base. I’ve made energy bars with all 4. My favourite is dates for their texture and sweet, caramel flavour. I like raisins for flavour and consistency too plus they’re inexpensive and easy to find. I haven’t used figs or prunes as much but they do work as a base as well. You can also use dried cherries, apricots, mulberries or dried apples. Depending on how dry they are, you may need to soak them in boiling water before using in your recipe. 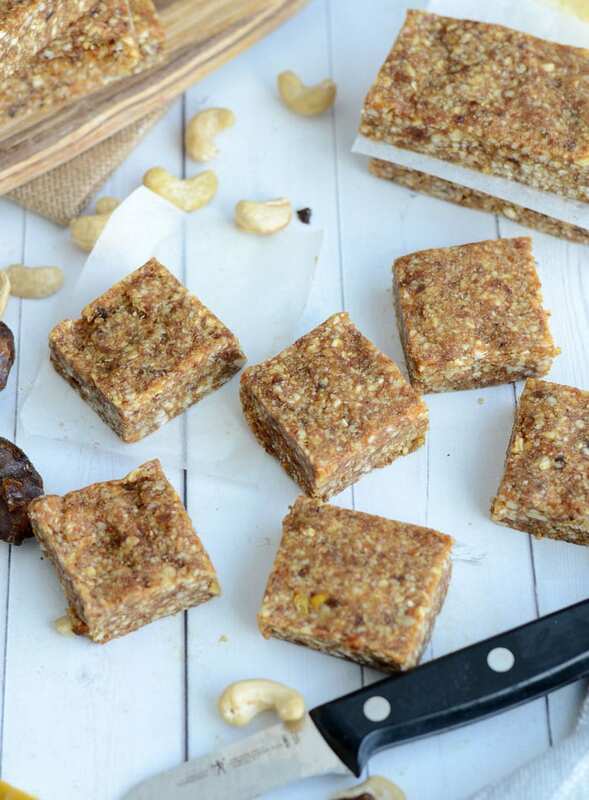 You can try raisins in these Nut-Free Chewy Vegan Granola Bars. Depending on what I’m making, I’ll use nut butters for flavour and/or binding. Peanut butter is my go-to and goes so well in so many different recipes but almond butter and cashew butter are also delicious! I also like adding tahini to my bars. You can try almond butter in these Raw Almond Butter Cookies. A good staple for increasing the protein content of your energy bars and adding sweetness without additional sweeteners. I like pea-based protein powders such as Vega Performance Protein best for recipes but hemp protein is also a good choice! Try protein powder in these No-Bake Coconut Protein Bites. My go-to nuts for creating the base of energy bars are cashews and almonds. Walnuts, pecans, hazelnuts and hemp seeds also work well. I’ve used hemp seeds as the base of a recipe but other seeds like chia and sesame are usually just an add-in. You can try hemp seeds in these Raw Hemp Seed Maca Energy Balls. I often add a few tablespoons of chocolate chips or cacao nibs just to cover my chocolate-craving bases! You can also use chopped dark chocolate or carob chips. I use Enjoy Life Chocolate Chips for all my chocolate chip recipes. Try chocolate chips in these Oatmeal Chocolate Chip Cookie Dough Balls. Cocoa powder is inexpensive but processed and doesn’t offer much in the way of nutrition. Cacao powder costs a bit more but is nutrient-rich and packed with antioxidants. They can be used interchangeably in raw energy bar recipes. You can read more about the difference between the two in this post. Try cacao powder in these Vegan Chocolate Peanut Butter Protein Balls. I like adding pure vanilla extract to most recipes and I’ll also keep almond and peppermint on hand. You can try peppermint in these No-Bake Vegan Peppermint Mocha Brownies. I add a small pinch of pink sea salt to almost all my energy bar recipes. I find it really enhances the flavour of pretty much everything! Try it in these 2-Ingredient Salted Peanut Blondie Bars. 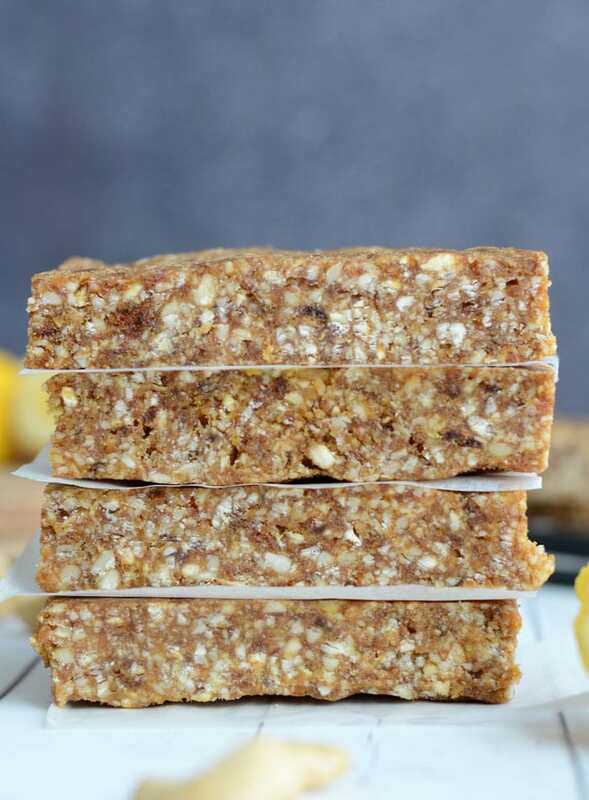 If you love coconut, unsweetened shredded coconut is a must-have for making snack bars! Try it in these Lime Coconut Energy Bites. If I’m keeping a recipe nut-free or lower in fat, I’ll usually use either rolled oats or quick oats to hold everything together. You can try these Raw Nut-Free Gingerbread Balls for an oat-based recipe. If you need a little additional binding and added sweetness, pure maple syrup is the way to go! Those are the basics of raw energy bar recipes. Some of my favourite energy bars are made with just dates and nuts. I love cashews, dates and sea salt. Coconut, dates and almonds is awesome. Peanut butter, dates and cashews is great too. 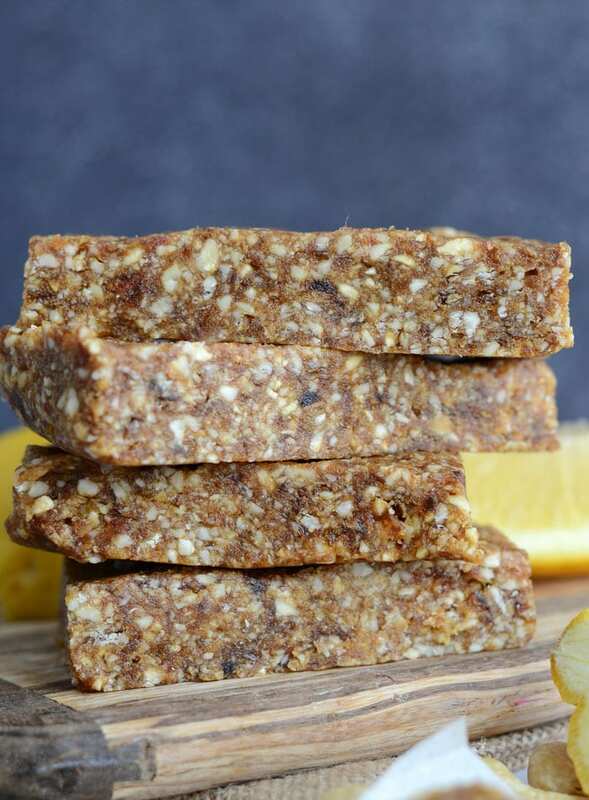 You can get really get creative with energy bar recipes and come up with the most delicious and satisfying, simple healthy snacks. 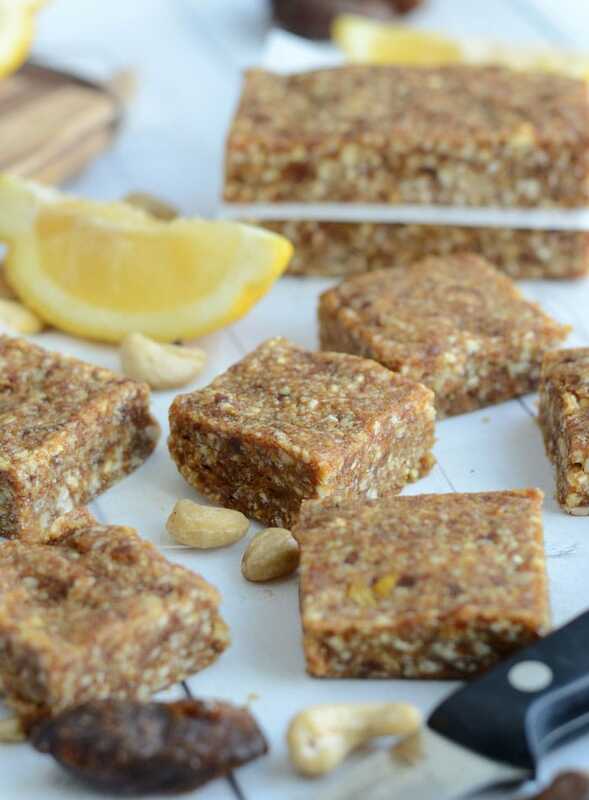 These homemade lemon pie larabars are made with dates, almonds, cashews, lemon and sea salt. They taste fresh, flavourful, energizing and refreshing. They store nicely in the freezer, travel well for fuel on-the-go and contain plenty of nutrition to keep you going through busy days. You could wrap these up individually in wax paper or just take them to go in a container. I pressed mine and cut them into squares but you can also roll them into delicious, little energy balls. There isn’t really too much else to tell you, you can’t get much easier than this! 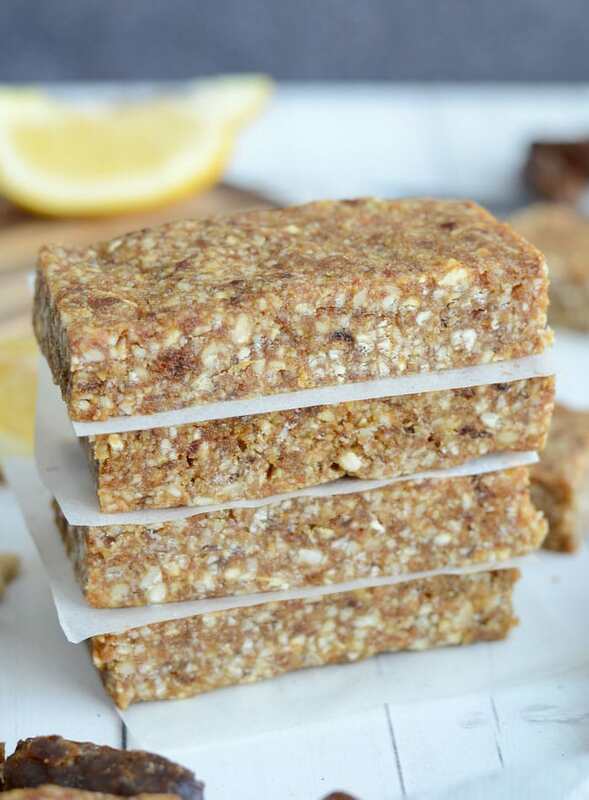 I hope you enjoy these simple, nutritious, whole-food bars. Grab one anytime you need a boost of natural energy! 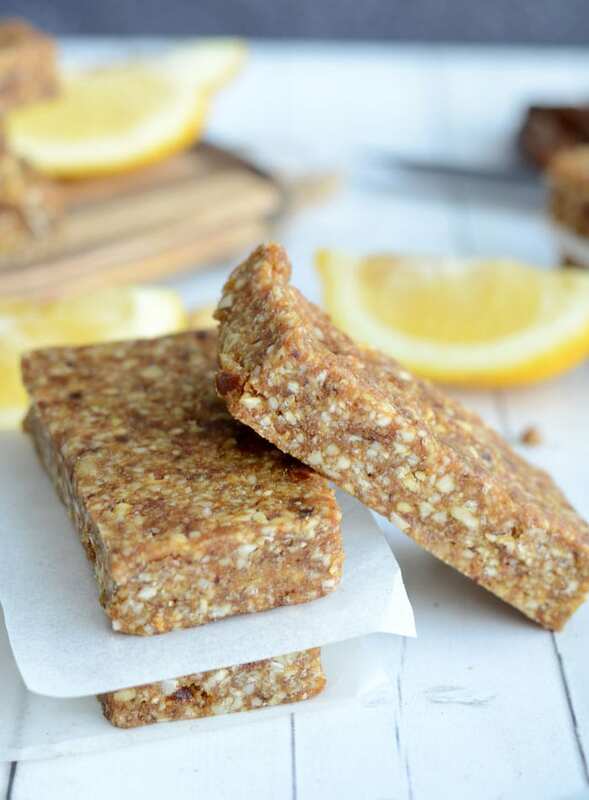 Simple, whole food, nutritious ingredients make up these fresh and flavourful lemon pie energy bars. Grab one anytime you need a boost in natural energy! Place the nuts in a food processor or high-speed blender and process until broken down. Add dates, lemon and sea salt and continue blending until it forms a dough. Remove from blender and press into a parchment or wax paper-lined baking pan. Alternatively, roll the dough into balls. Place in the freezer for an hour or two. Cut into 8 large bars or 16 squares. Store in the fridge or freezer. Lightly adapted from Leite’s Culinaria. These are definitely on my to-make list – they will be great for snacks for my delivery clients! Thanks for the fantastic recipes as always miss Deryn! Yum I’ve used other recipes for homemade larabars and they are always so yummy. Thanks for sharing! You know I love ME some snack bites! heheh. These are refreshing, great way to describe them! Looking forward to trying these! Do you use salted or unsalted nuts? Raw ones? A combination? Thanks! I usually use unsalted raw nuts, but they don’t have to be raw. Unsalted for sure though! Thanks! These are delicious and keep for quite awhile in the refrigerator. I coated mine with dessicated coconut which keeps them from sticking together and makes them less sticky to eat on the run. Thanks for the great recipe! Mmmm, coating with coconut is a great idea! Glad to enjoyed them! You should give credit where credit is due– this recipe is from the book POWER HUNGRY: the ultimate energy bar cookbook. Your changes are too minor to say that this is your creation– see Blogher guidelines for recipe development. My mistake – I’ve added the credit to Leite’s Culinaria (which has re-printed from that book) in the recipe. Thanks for catching that! Made these last night and decided to roll them into balls. They came out fantastic. Sure, prunes, figs, raisins or cranberries should all work. You might have to soak them first though. The dates I use are quite soft so they work well. I just made these using a mixture of dried cranberries and sultana raisins and they turned out great! How long do these keep? I added some grated ginger and chia seeds for extra oomph. I also used a lot more lemon juice. Did not rate bc regardless of how many stars I clicked, it showed 5 stars. Quite misleading – tried with 3 different browsera. I would give it 3.5 stars. These are wonderful! I would even add more lemon next time. I did add some toasted organic coconut and it was a great add. I would like to try this. I’ve made other energy bites where I simmered the dates vs. blending them dry. Would that work here? In the past I’ve found that my food processor doesn’t blend it fine enough. Thanks! If your dates aren’t soft and fresh, you can soak them in hot water for 15 minutes before using. Enjoy.